The ruling Trinamool Congress on Friday said the party would observe “black day” for the next two days in protest against the “manhandling” and harassment” of a party delegation at Assam airport on Thursday. Members of the delegation, who returned to the city on Friday morning, claimed they were treated like “infiltrators”. 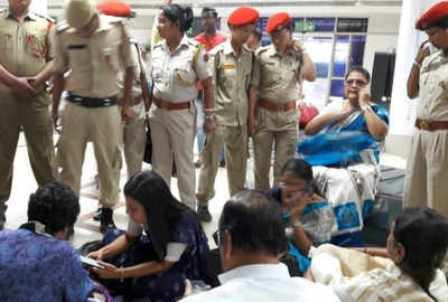 The party delegation comprising six MPs, one West Bengal minister and one MLA was confined to a room at the Kumbhirgram airport in Silchar on Thursday on the ground that prohibitory orders under Section 144 were in force in Cachar district in Assam. “We condemn the incident. Our delegation had gone to meet the common people. But they were not only detained in the airport but also heckled and harassed. We will observe black day during Saturday and Sunday across districts and blocks,” party’s Secretary General Partha Chatterjee said. He said the exclusion of 40 lakh people from the list of the draft National Register of Citizens (NRC) in Assam was “politically motivated”. “MPs are free to move, but they were not allowed to talk to the people. Had MPs been allowed to meet people, they could have got the opportunity to take stock of the situation and put across their suggestions to the Centre,” state Minister Firhad Hakim said at the Kolkata airport after returning from Assam. Roy also took exception to Union Home Minister Rajnath Singh’s statement in the Lok Sabha on Friday that the delegation was detained at the airport to maintain law and order in the north-eastern state. “How can six MPs, a minister and a MLA create trouble in a state?” Roy questioned.